Engine in which a mixture of air and gasoline is compressed and ignited to produce an explosion whose energy is converted into mechanical energy. Container closing the bottom of the engine block; it is the reservoir for the oil that lubricates the engine’s moving parts. Electric device whose two electrodes produce the spark necessary to ignite the air/fuel mixture in the cylinder. Lever, activated by the camshaft, that drives the inlet and exhaust valves to open them. Metal moving part in the cylinder and attached to the connecting rod; it compresses the air/fuel mixture, then receives the thrust from the burned gases. Component of the air-conditioning system circulating coolant, which cools the air in the passenger compartment when it is hot outside. Disk connected to the crankshaft, which uses the kinetic energy produced at combustion to regulate the crankshaft rotation during the rest of the cycle. Main engine casing, which encloses the cylinders. Set of pipes at the exit of the cylinders, capturing the combustion gases to conduct them to the exhaust pipe. Part that opens to allow the burned gases to escape. Electric wire carrying the high-voltage current from the distributor to the spark plugs, which produce sparks igniting the explosion. Part of the engine covering the cylinder heads, where the fuel is burned. 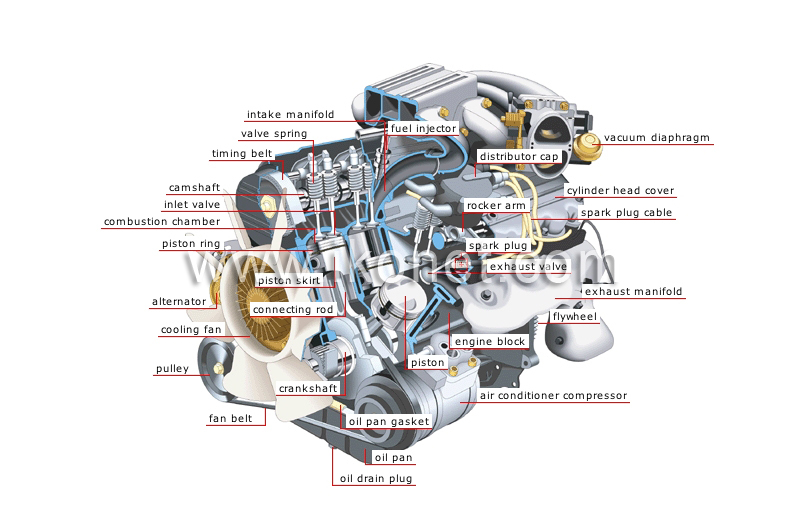 Device connected to the distributor cap specifying the precise moment ignition must be produced relative to the engine’s rotation speed. Unit supplying the electric current necessary for producing sparks that ignite the fuel in the engine. Plug closing the hole at the bottom of the oil pan through which used oil is evacuated. Packing providing the seal between the oil pan and the engine block. Rubberized bands mounted on a pulley and linked to the engine, driving the fan and the alternator. Shaft consisting of a series of cranks, which convert the alternate rectilinear motion of the piston/connecting-rod assembly into a continuous circular motion. Part attached to a shaft, whose rotational movement it transmits by means of a belt. Mechanism with blades blowing air across the radiator in order to cool the liquid it contains. Articulated shank powered by the gas explosion; it transmits the thrust from the piston to the crankshaft. Current generator driven by the engine, which recharges the battery to supply the electric system. Side surface of a piston guiding it along the inside of the cylinder. Circular ring mounted on the piston providing a seal between it and the cylinder. Part of the cylinder in which the pressurized air/fuel mixture is ignited and burned. Part that opens to let the air/fuel mixture into the cylinder. Axle driven by a belt, a chain or gears connected to the crankshaft, controlling the opening and closing of the valves. Strap connecting the crankshaft to the camshaft. Spring that brings the valve back into the closed position. Passages through which the air/fuel mixture enters the cylinder. Device pulverizing the fuel in the combustion chamber.